Amaircare 4000 VOC Chem Airwash Air Purification System, a commercial grade air scrubber, that focuses on HEAVY VOCs, gases, and & odors. 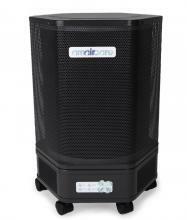 It is a top quality, heavy duty portable air purifier for a wide variety of industrial applications. Coverage for 18,000 ft3 (provides 1 ACH/hr). Comes with a 5 YEAR Limited Warranty. The Amaircare 4000 VOC Chem focuses on heavy VOCs, gases, and odors primarily and uses the 16in Ultra VOC kit which contains a 30 lb canister of carbon for heavy adsorption. This unit does NOT have a HEPA filter because the focus is for heavy odors, gases, and VOCs. The Amaircare 4000 VOC Chem focuses on heavy VOCs, gases and odors primarily and uses the 16in Ultra VOC kit which contains a 30 lb canister of carbon for heavy adsorption. Coverage for 18,000 ft3 (provides 1 ACH/hr). However, if your interested in particulate and VOCs, gases, and odors, we recommend choosing the Amaircare 4000 VOC Chem with HEPA found here. Furthermore, if your needs change, you can convert your unit simply by replacing the filters with the corresponding filters for your focus. Amaircare air cleaners (air scrubbers, chem bio airwash, air wash) are individually tested to meet HEPA standards and beyond. This means that the complete air cleaner system containing the HEPA filter will remove at least 99.97% of all particles as small as 0.3 microns (1/300th the size of a human hair or 0.000012 of an inch) that enter the air cleaner and are also 95% efficient at 0.1 microns. 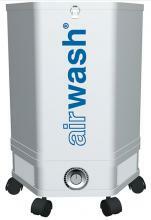 The 4000 is built to provide air filtration for large commercial spaces. Filter section is easy to access for maintenance. 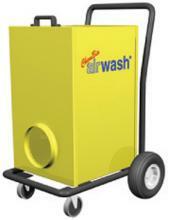 4000 VOC Chem Airwash purification system requires 1- 16in ULTRA VOC kit. 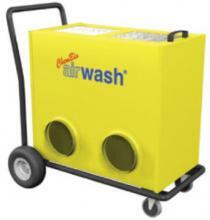 The 4000 Chem with HEPA Airwash purification system requires 1 - 16 in Annual Plus VOC kit and 1 - 16in HEPA Filter. Top Filter Access with Latch Closure: Filter maintenance is convenient and simple. 6” Round Intake with Duct Port: Allows for rigid or flexible ducting connection to configure targeted source capture of pollutants. Louver Directed Outflow: Directs air out four of six sides with downward exhaust to distribute clean air evenly. 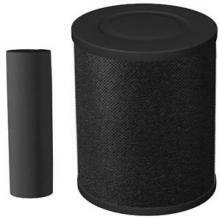 Standard Ultra VOC Filter: 9475 g canister of granulated carbon for cases requiring extreme chemical and gas pollution capture. Customized treated Carbon fills available upon request. Easy Twist Configuration: Filter canister locks in place without difficulty. Interior Filters: Filters are contained and protected within a durable steel housing. 6 Swivel Castors: Provide effortless mobility without the need for lifting. Steel Construction with Baked Thermoset Powder Finish: Tough wear and tear resistant housing that doesn’t off-gas chemicals, true to the integrity of providing clean air! Variable Speed Control: Change the system rate of air flow to suit capture needs to the level of contaminants in the environment. High Efficiency AC Backward Curved Motor: High performance air flow at a low running cost, minimal drain on electricity resources with years of continuous performance. Heavy VOCs, gases, & Odors (Shown) - This unit is frequently referred to as 4000 VOC Chem Airwash Air Purification System with 30 lb carbon canister. This unit uses a prefilter and a 30 lb carbon canister called Ultra VOC filter kit and does not use a HEPA. Particulate Focus & VOCs, gases & odors - This unit is referred to as 4000 VOC Chem with HEPA Airwash Air Purification System and is shown as a separate item to avoid confusion. This unit uses a prefilter and 7 lb carbon canister along with a HEPA filter for the particulate filtration as well as VOCs, gases, & odors. 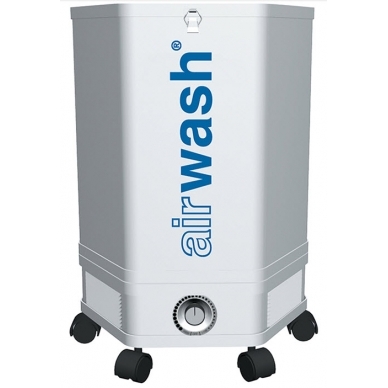 Amaircare 4000 VOC Chem airwash air purification system can be custom designed to solve numerous air purification needs and is frequently referred to as an air scrubber, air wash, Chem Airwash, Heavy Duty or Commercial air purifier. Download the Amaircare Product Catalog by Visiting Amaircare Product Catalog. 5.0 Powerful little thing 11/05/2018 By Chad Siebenaler I purchased one of these as a precaution to control VOC and dust from 3D printers. I have done several studies with the Foobot Air quality meter over the past month and it is proven to be very effective! I would make sure to discuss needs with US Air Purifiers staff...very knowledgeable. The guided me to a cheaper and better option then I started with. Nice to have people that care about their customers!